By Carolina Matos, Editor – João Carlos is an award-winning master photographer. In 2009, he was the winner of the Hasselblad Masters Award, one of the world’s most prestigious awards in the industry. Most remarkably he was the youngest ever to receive this prize. He was born in New York, in 1977, to Portuguese immigrant parents from the region of Caldas da Rainha, mainland Portugal. His father is from Nadadouro and his mother from Fanadia village. Growing up, his life would turn to be a true blend of opposing worlds – the sophistication of cosmopolitan New York and the quietude of his parent’s provincial roots in Portugal where João spent time with his grandparents. Back and forth between the two countries, João would end up leaving New York behind at the age of 15. “My parents decided that they missed their home land and they moved back to Portugal. I didn’t have much of a choice at the time,” he said. For the last four years, João has been commuting between Lisbon and New York on a regular basis. Sometimes he feels uprooted and alienated from family and friends. “I spend nearly six months here and six months traveling. I find that in Portugal people have stopped inviting me to parties because I am always traveling and I won’t show up anyway. So let’s say that if it wasn’t for the social networks, it would be practically impossible to keep relationships with family and friends,” he said. It has been a long road from when he was a child of immigrants growing up in New York dreaming of becoming an artist. As far as he can remember, he has always been in love with the arts and it was at a very young age that he discovered photography. “My first artistic memory was drawing on my bedroom walls, when I was about two years old. I also remember asking my mother for a camera at about age five. She gave me a toy camera for Christmas and I looked it over and requested she gave me a real camera, because that one did not have a flash,” he recalls. In Lisbon, he studied fine arts, photography and painting along with sculpture and art history at AR.CO — Centro de Arte e Comunicação — an independent art school dedicated to art experimentation, crafts and visual communication. Yet, for him true craftsmanship came with practice. “The best school was working as an assistant to other photographers, like João Palmeiro or Alexander Koch. I worked as an assistant for four years before pursuing a full time career as a photographer,” he said. As an art photographer, João has distinguished himself for his remarkable skill to work with natural light. He explains, “My passion for natural light comes, I think, out of necessity. I have not had an easy career. So I had to learn quick how to make the most of what I had available to me. Currently working out of Lisbon and New York, João creates kinematic photographic art compositions from the perspective of a painter capturing the emotions that tell a story. João Carlos’ unconventional art is all and everything. He is driven by a metaphoric creative force that inspires and transcends. He is also a poet and story teller that speaks of a beauty that reveals, surprises, engages and delights. At the age of 34, João Carlos has established himself as world master photographer. Besides the international Hasselblad Masters Award in 2009, he was awarded in 2005 with the 7th Photography Bienal Award of Moita, Honorable Mention, Moita, Portugal; in 2003 with the 6th Photography Bienal Award of Moita, Honorable Mention, Moita, Portugal; and in 2001 with the 11th Bienal Internacional de Arte de Vila Nova de Cerveira, Portugal. His work has been shown in art galleries around the world in both individual and group exhibits. The Hasselbald Master Award’s winning pictures have been the subject of a worldwide itinerary exhibit underway that includes Hong Kong, New York, London, Amsterdam, Copenhagen, São Paulo, Rio de Janeiro and Bogota. The exhibit is now scheduled for for June 1, at Castelo de São Jorge, in Lisbon, where his awarded pictures will be featured in monumental size, on a wall to wall display. Another exibit is secheduled for June 18, at Galeria da Boa Vista, in Lisbon. Additional exhibits are being planned in Lisbon in different venues for the upcoming months. As a Hasselbald Master Award winner, his work is featured in the book “Hasselblad Masters” (2010) translated in five languages and distributed in 80 countries. He has also authored and published a book of photography titled “American Circus in Britain” (2011) documenting the nomad lifestyle of the Uncle Sam’s Great American Circus’ workers and performers during the Fall of 2010, in the town of Ellesmere Port, Northwest Britain. Apart from the art exhibits and photography competitions circuit, João makes a living as a commercial and fashion photographer. He also runs a boutique production house in Lisbon and New York City. His work has been featured in several magazines and TV Programs worldwide such as BCC, Direct Arts Magazine, iFotoVideo , Victor by Hasselblad Magazine , Photoshop Australia magazine , O mundo da Fotografia Digital , and PH Magazine , Plum TV, Caracol TV , RTP international and RTP 2 . 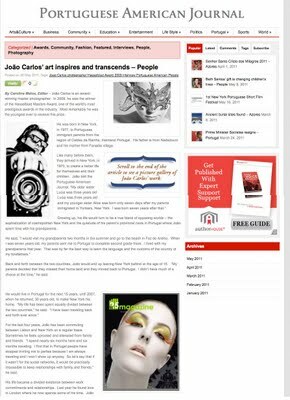 Most recently, João Carlos’ work has appeared in numerous publications and magazines namely EllE, Forbes , Dilema ,Wallpaper ,Nstyle Magazine, Umbigo Magazine, Numero Magazine, Moda Noiva, Cerimonia, Luna International, Six degrees Magazine, J’adore Magazine, Blink Magzine, Dif Magazine, DP Arte Fotografica, W25 Mag, Iconography Magazine, Emerge Magazine Connecticut Home & Gardens, Modern Homes and Archinect.